It has been loudly and repeatedly proclaimed by opponents that capital punishment is “unfair.” In their view, it is unfair because (1) only some murderers receive the ultimate sentence and (2) they are not the most deserving. Underlying this view is the remarkable assumption that fairness is subject to “fine tuning” and “moral accuracy.” It is argued here that this assumption is indefensible both in theory and in practice. As a theoretical matter, it is insupportable to suggest that matters of conscience, right and wrong, are subject to calibration or “accuracy.” Right and wrong are not determined in the same manner as taking blood tests. Moreover, and this lies at the heart of the fallacy, there simply is no agreement upon what is fair punishment for unlawful intentional killing. 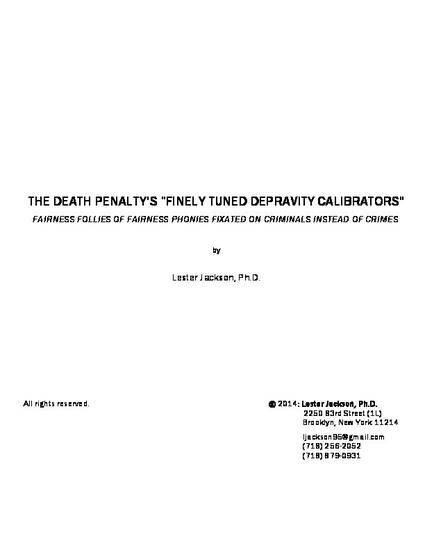 Regarding the death penalty, the values chasm is unbridgeable In practice, this is clearly demonstrated by the considerations employed by those who allege unfairness. Using chicanery, outright falsehood and abuse of power, they have a laser focus on convicted criminals with no concern for past – and future – victims. It is easy to worry about criminals when the suffering of victims is left out of so-called fairness calibrations. When the assessment of fairness is confined to comparing the fate of one criminal against another, the reductio ad absurdum is that there should be no punishment for any violent crime. This is the inevitable result of what is nowhere found in the actual written Constitution but, nevertheless, has been ordered by anti-capital punishment United States Supreme Court justices: “individualized sentencing.” That mandate, which places a heavy focus upon a criminal’s background and record, should be reconsidered. Penal codes make certain conduct criminal. It is conduct that should be the prime (and perhaps exclusive) consideration. In determining punishments, the focus should be on crimes and not on the criminals who commit them. Based on such determinations, another view of fairness is presented.